The Parañaque City Government, in cooperation with the Nat’l. Risk Reduction & Disaster Management Council, Office of Civil Defense, DILG, Phil. Red Cross (P’que Branch-Rizal Chapter) and barangay government units sponsored back-to-back trainings on disaster preparedness. 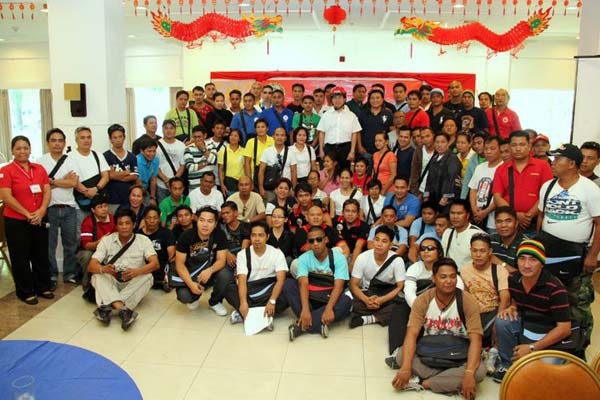 The seminar on First Aid, Basic Life Support and ambulance operations had members of barangay disaster brigades, Bernabe Quick Response Team, P’que DepEd employees and Parañaque Diocese personnel as participants while the training on disaster management was attended by Parañaque Disaster Risk Reduction & Management Council (PDRRMC) committee heads and barangay chairpersons. The trainings were handled by instructors from the Parañaque Red Cross, P’que Elite Rescue Unit (P.E.R.U. ), Pasig Rescue Head Richie Angeles, OCD-NCR Training Head Edna Conda and OCD-NCR Dir. Susan Cruz. In photo: Mayor Jun Bernabe (center) joined by Planning Officer Engineer Benigno Rivera poses for posterity with the participants and resource persons of the two seminars on disaster risk reduction, response and management. (Public Information Office). Travel Tips that can help you this summer! Next story Maynilad offers water to NAIA; Will they dig holes on the runway too? Previous story Want to track your passport applications? Click here.